SUQQU changed the formula of their cream foundation in 2018. This Treatment Primer is not new. Finally I got a sample, and let me share how I felt with you. Suqqu insisted this primer is “peony pink”, but when I dropped on my arm, I found the white-beige/pink cream, and it reminded me Cosme Decorte Complete Flat Primer, I decided to compare. In the picture above, left is the swatch, and right is the blend. 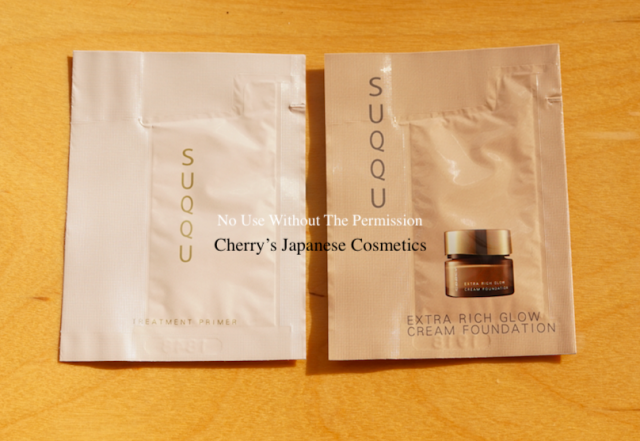 Guess it is difficult to see due to the lighting, Cosme Decorte side is more white than SUQQU side. I should better to compare this primer to Addiction Primer Addiction, or RMK Makeup Base, or Amplitude Clear Cover Liquid Base. Lunasol Smoothing Light Makeup Base is also a candidate to compare. I mean, at least on my arm, this SUQQU Treatment Primer does no effect of color controling, I had expected it has pink cream, and the effect of pink color controling. If you need color controling effect, guess SUQQU Blooming Glow Primer is better for you. And also, there are no covering your uneven skin tone, if you need covering effect, guess SUQQU Refining Primer is better, I am sure. 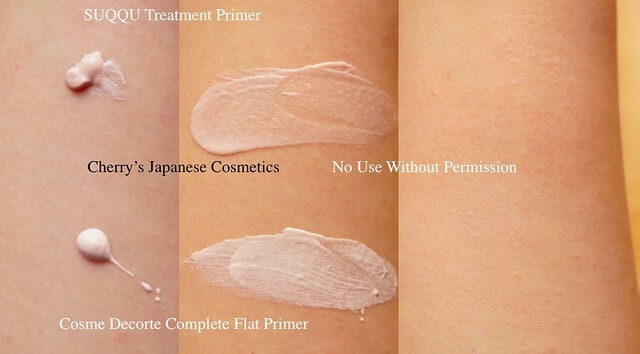 So, what is this primer for? I don’t know. Checked what Japanese reviewers are saying, some found their uneven skin tone to even (I disagree for my skin), and some liked this light but well moisturized texture, on the texture point, I agree. The texture on my face is well moisturized, but light and after blending this foundation primer well, and I found my face is quite smooth, but no dryness. There are weak sunscreen effect of SPF20・PA++, it is also not fantastic to use under the strong sunshine.